Just a few miles north of San Francisco sits Sausalito. Located in Marin County, California, Sausalito is a little coastal city with a lot to offer. Situated at the northern end of the world-famous Golden Gate Bridge, the city offers incredible views in every direction and is well known for its unique houseboat community and beautiful Bridgeway Promenade. Sausalito is one of the top spots for kayaking in California, with plenty of great drop-in sites and kayaking routes to enjoy and discover. Both advanced kayakers and total beginners can find kayak locations to suit them in Sausalito, and here are a few of the best spots to try. If you're an intermediate kayaker with a good level of experience, this is a super spot to start your Sausalito kayaking adventure. The waters can get a little choppy due to the currents beyond the cove, but there are plenty of great kayaking trails to try out here, with the stunning Golden Gate Bridge right next door and Alcatraz Island also visible to the other side. The Bridgeway Promenade, often incorrectly called the Sausalito Boardwalk, runs from Richardson Street to Princess Street and offers some of the very best views of Sausalito and its waters, but instead of simply walking along it, you can kayak along the very same route and can even more special views than you would by land, especially in the early mornings or evenings as the sun rises or sets. Sausalito is well known for its stunning houseboats, with a beautiful little community that has built up over nearly seven decades. Walking and bus tours of this part of the city can be enjoyed, but kayaking around the Sausalito houseboats is also possible too. The houseboats are one of the city’s truly unique treasures and definitely deserve to be seen from the comfort of a kayak. Situated out in the San Francisco Bay, Angel Island is an incredible place to visit by kayak, if you've got the skills and physical endurance to get there. It's a challenging trip over to the island, but it's definitely worth the effort, with Angel Island providing simply incredible 360-degree views of Sausalito, the San Francisco skyline, and surrounding areas, including Mount Tamalpais. There are several great kayaking companies to be found both in Sausalito and in nearby San Francisco. If you want to enjoy the best kayaking experiences in this little corner of California, be sure to check out one of the companies listed below. Offering guided kayaking tours, as well as rentals and other services, they’ll help you and your group make magical kayaking memories in Sausalito. The primary kayaking company in Sausalito, Sea Trek has been operating for several decades now and provides every kind of kayaking service you can imagine, including rentals, classes, and guided tours. Tours run from as short as three hours up to full-day or even overnight experiences and take in the gorgeous Sausalito skyline, houseboats, and nearby landmarks like Golden Gate Bridge, as well as Angel Island. Starlight and evening tours are also available, as well as family-friendly tours designed with kids in mind. 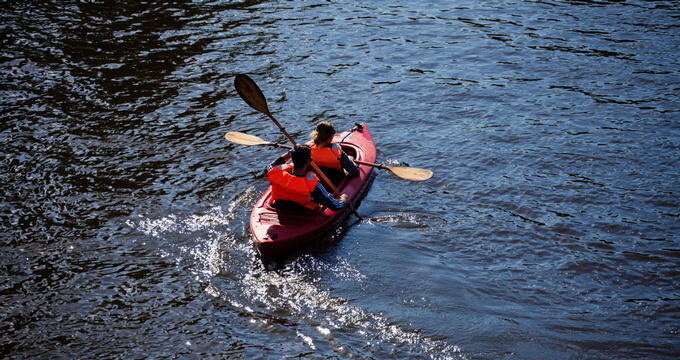 2-3 person kayaks, as well as life jackets and top quality lightweight paddles are all provided. Situated just over the Golden Gate Bridge in the city of San Francisco, SF Kayak & Adventures runs premium guided kayak tours along the coastal waters of San Francisco and up to Sausalito, taking in landmarks like the great bridge itself, as well as Alcatraz Island, the Sausalito Houseboats, and more. You'll have a great chance of a close encounter with sea lions or other wildlife along these excellent kayaking tours, which are fully suitable for kayakers of all abilities and experience levels.